The 97-year-old talks about skiing the way one might describe finding a soul mate. 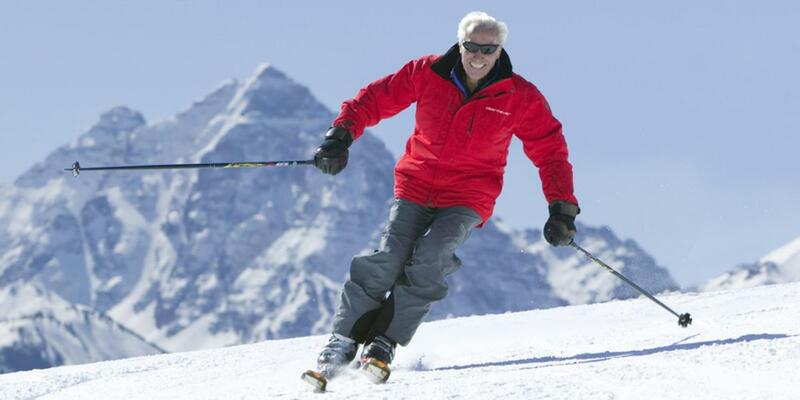 Klaus Obermeyer, the founder of the eponymous ski apparel brand, is close to a century old and in great shape. He goes to work at the Aspen office nearly every day, usually after hitting the slopes. Many days he also swims or practices martial arts. Born in an alpine village in Germany, Obermeyer moved to Aspen in 1947 at a time when the former mining community was a ghost town. He became a ski instructor and helped propel the sport’s popularity forward, first by teaching celebrities such as Gary Cooper, and then through apparel innovations that made it accessible to a wider audience. We chatted with the skiing veteran about his lifelong love of the pastime, how his company contributed to its evolution, and how he manages to stay healthy and vibrant while pushing 100 years old. What was your first skiing memory? I went for a little walk with my dad. I was three years old, and there was a small hill with a couple of skiers on it, and I thought, “Wow!” My dad wanted to keep going, and I just kept him there and said, “This is unbelievable…this is absolutely terrific.” After that, I decided to make my own pair of skis. My father used to buy oranges in big crates from Italy, which were made out of very thin chestnut boards. I nailed my best pair of house shoes (don’t tell my mom) onto a pair of those boards with string around it, which I tied to my knees. Those were my first skis. It was the most unbelievable thing to be able to slide down on snow. It’s just so fun, you know? Then, when I was six, I got my first real pair of skis. They had permanent tips and a binding, and it was an unbelievable luxury. I could go up and climb a mountain with them, ski down, and jump. It was just the greatest gift you could get. When you first moved to Aspen, skiing wasn’t popular yet. When did that change? It started picking up after we had the world championship in Aspen in 1950. That lasted one week, and it was the best snow you can imagine, what we call "champagne powder," so dry and fluffy, it’s fabulous. We had blue skies every day and people came from all over the world to participate. It was just absolutely ideal conditions and that really started the publicity. I taught skiing for 12 years and my clients included many movie actors and actresses who used to go to Sun Valley. What made you shift gears to create apparel? We had the world’s longest single chair lift up Aspen Mountain. It was at least a 15-minute ride up and it was so cold. We went up in long winter coats, but you couldn’t ski in those coats, so we sent them down the lift. I thought, “Maybe it would be a good idea to have something that’s warm but not so long that you couldn't ski in it.” So, I cut up the down comforter my mom sent with me to North America and made a parka out of it. I had feathers in my cereal for about three weeks after that. I looked like the Michelin Man, it was pretty awful, but it was warm and it worked. Eventually Gary Cooper bought it from me for $250. That was a lot of money then. I started with a sewing room in Aspen and had 17 girls sewing quilted parkas. They were warm and you could ski in them, so other companies started to copy us, and a ski-clothing trend was born. Now, it’s so sophisticated technically. It’s totally different. What excites you about the technology and how different ski apparel is today? I think now we are on the leading edge of technical possibilities. The jackets we make are more breathable, increasingly waterproof, and less heavy. Having underarm zippers, for example, if you get warm, you can cool down that way. A lot of the clothing we make now, you don’t want to take it off even when you’re done skiing. What do you think has kept you so healthy and active at 97 years old? I think just working out, being physically active, is so important. I also did Aikido—a Japanese martial art that’s quite special—actively for many years, and I still partake in it. And it depends a little bit on the weather, now: If it’s really stormy, I’d rather play chess, but if it’s nice like today, I go skiing.